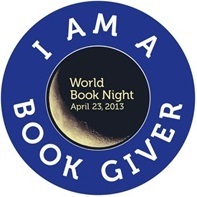 Armacost Library News: World Book Night 2013: The Gift of Books. I signed up as a book-giver again this year. And I signed up Armacost Library at University of Redlands as a pick-up location for WBN 2013. The link above is the brief post I wrote about my library’s tiny book-giver reception. World Book Night-US 2013 is next week, Tuesday, April 23.